I am often asked about the differences between our 14, 16 and 18 oz square & rectangle tents. Choosing the right pole tent for your party tent, church tent, tent for revival services or commercial event can be challenging. You want to pick the one that will serve you best. The following will help you decide which will be the best choice for your rental business or ministry. Similarities: The 14, 16 and 18 oz pole tents are built with the same strength of construction with seat belt on every seam top to bottom, triple stitching & steel to steel connections. The 14 oz is available in 19 different tent colors. You can go with the classic all white tent or draw people in with the bright & beautiful colors. All of the vinyl is translucent. That means the lighter colors will allow light in during the day & light up like a “lamp shade” at night drawing people in. The 14 oz is a very popular choice because it is not as heavy to set up. The 16 oz blockout is available in 16 colors. It doesn’t allow sunlight through which will make it cooler under the tent. That can make a big difference for your event keeping it cooler for everyone & everything under the tent. 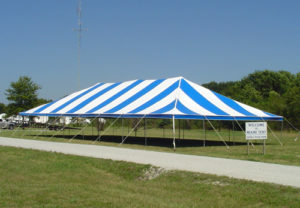 It is our most popular in the square & rectangle for party tents and commercial tent events. We also offer 18 oz blockout in white. This is ideal for customers who need a square or rectangle tent and want it to last as long as possible. We ship all over the world and our customers in hot climates love our tents that offer the “blockout” feature. Keep in mind that the tent top will not light up like a “lamp shade” at night. It is good to know that during the day you will always get plenty of light through your sidewalls so this tent is a great overall choice. The 14, 16 and 18 oz tent tops give you a wonderful variety of choices so that you can be sure you will have a wonderful tent event.